I have been a long time user of Clinique Products. I love how great they work on my face. 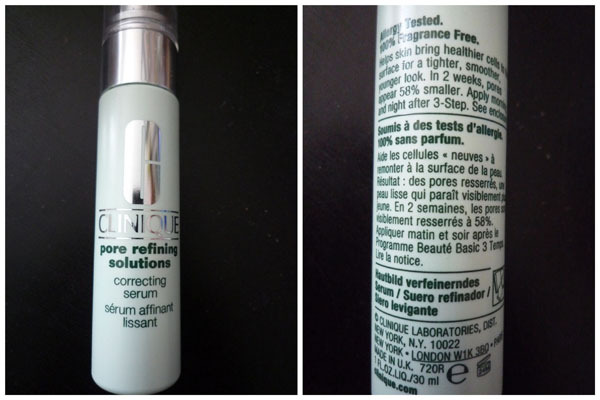 My favourite Clinique product has to be the pore refining solutions correcting serum. The pore refining serum is a miracle for people who have larger and more noticeable pores. It is a serum that helps skin bring healthier cells to the surface. By bringing the healthier cells to the surface it makes your skin tighter. My pores are unfortunately large 🙁 but using the serum makes my pores more refined or smaller looking. The serum gives my face a more smooth and tight for such a great look. I really like how easy it is to use and how after I put it on it makes my face so soft. This product is awesome and I love it. I noticed immediately the difference in my complexion. In about a week my pores looked so much smaller I was so happy I could have cried! Ladies you will truly love this product it makes your face so silky smooth and there is such a dramatic change in your pores you will be totally impressed. I also like how long it lasts. 1 1fl oz, bottle lasts me around 3 months. Wow, that in itself to me is worth everything. It comes in a great pump bottle that is easy to use. It is 100% fragrance free and it has been allergy tested. It is great for anyone with sensitive skin. I have used it and I have sensitive skin, some of my friends have dry or oily skin. The pore refining serum is perfect for any type of skin. And what do my friends or family members say? I was so happy when someone came up to me the other day and complemented me on how amazing my complexion was. I laughed inside, but was smiling from ear to ear. My family members have even commented on how great my face looks. Clinique products are AMAZING and when I say amazing they are the best on the market and really give you results. I think that Clinique products really work as well if not better than products you recommended by Dermatologists. I have gotten many other people to try the pore refining serum and they love it too. My daughter had large pores and after one use she noticed immediately her complexion was better and her pores looked tighter. She also noticed how smooth her skin was. She even told some of her friends how awesome Clinique pore refining solutions correcting serum is! I am so happy with this product and it just really makes you feel bea-u-ti-ful! It makes you feel like you just had a facial or just stepped out of the spa. This product is so luxurious and ladies everywhere should try it. I cannot say enough about how great the Clinique product is. Clinique really makes quality stuffs and the pore refining serum is great quality and it truly leaves you feeling like a queen! The only disadvantage is that the price for this products is little bit high. But as I said, it will last for long time – three months or so. I give this product two thumbs up and every lady should give it a try.